Nothing says summer like grilled chicken. 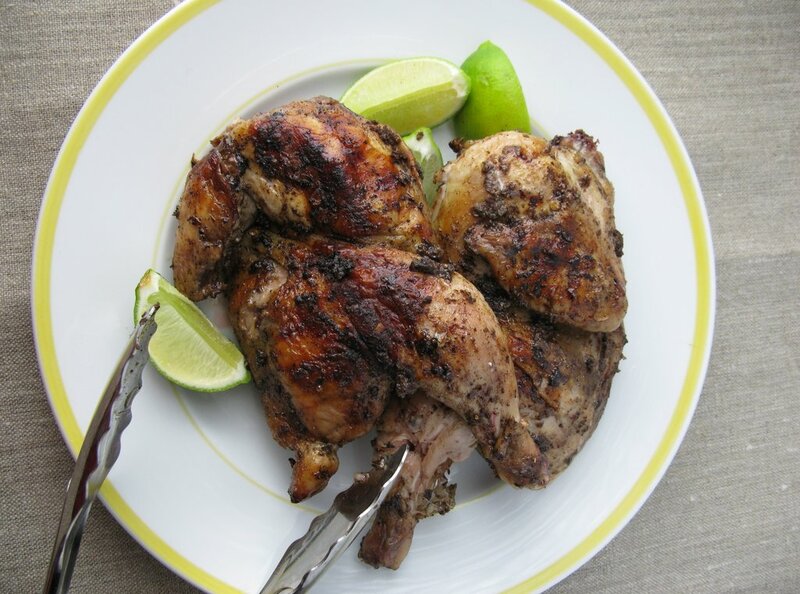 Pair the bird with the flavors of Jamaica and I’ve escaped the winter doldrums. As long as I don’t look outside that is. Here we’re splitting game hens, slathering them in jerk marinade and grilling them in our home fireplace. Of course you can cook them on a gas grill on in the oven for that matter. 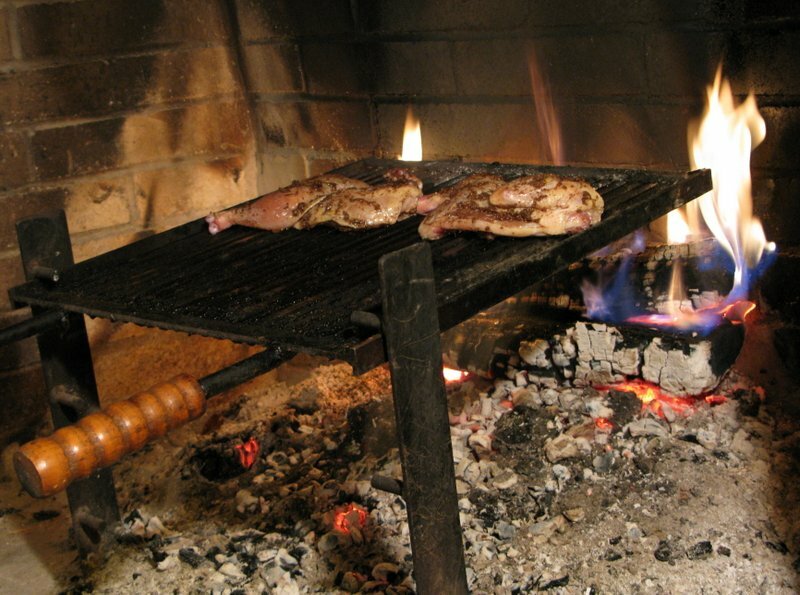 But if you’re adventuresome, cooking in the fireplace has many rewards. The flavor of the wood smoke adds to the pleasure of these birds. And we what better way to bask in the warmest corner of an old house in the dead of winter? 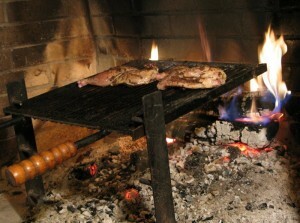 Here is a photo of a split game hen grilling on a Tuscan Grill in our fireplace. 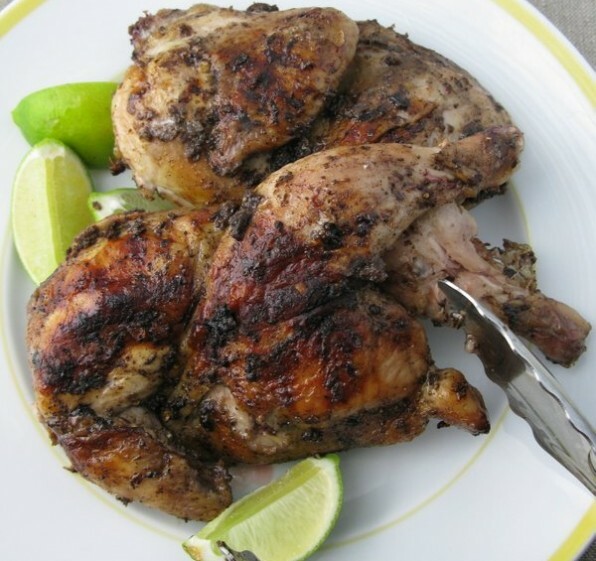 You can use this recipe with any chicken parts but we like the flavor of game hens on the grill. An optional step is to let the split game hens sit uncovered in the refrigerator overnight before marinating. This dries out the skin helping ensure a crisp crust after grilling. Our grill has settings that holds the rack 5, 9 or 14 inches above the ash bed. We position it at the highest setting for longer gentler cooking. Be warned. The firey taste of this dish depends on the variety of chile you use and the actual specimen. I used a Scotch bonnet chile, which is among the hottest known. But I suspect because it was grown in a greenhouse in Connecticut, the heat was tolerable. Fragrant rice cooked in water and coconut milk tames the heat. I especially like how it absorbs the juices and bits of the rub that fall off the birds after cooking. Split each game hen down the back to flatten. Then cut each game hen along the breast bone into two halves. Wearing gloves, split the chile in half. Remove and discard the seeds. Combine the chile, allspice, black pepper, cinnamon, nutmeg, scallions, ginger, garlic, soy sauce, lime juice and brown sugar in the bowl of a food processor or blender. Blend into a coarse paste. Sprinkle some oil on each side of the cut birds. Place them cut side down on the grate with the legs placed in towards the back wall of the fireplace, which should be the hottest spot. If your fire is steady, low and hot, expect to grill the birds for 10 to 15 minutes on this side. Hold your hand about 8 inches above the embers. You should only be able to hold your hands above them for 3 or 4 seconds before it gets too hot. (Or maybe less. We have chef hands.) Spray water on any flames that shoot up and scorch the birds. Flip over the game hens and continue grilling for another 10 minutes. While the chicken cooks, prepare the coconut rice. Bring the coconut milk, water and salt to boil in a small saucepan with a tight fitting lid. Add the rice. Stir. Cover the pot and reduce the heat to a very low simmer. Cook the rice for 15 minutes without uncovering the pot. Turn off the heat, stir the rice with a fork to fluff the grains. Let it sit covered for 5 more minutes before service. Serve the game hens with the rice garnished with chopped scallions and lime wedges. To cook the game hens in an oven, preheat the oven to 450°F. Place the jerk-paste-covered game hens in one layer on a large sheet pan. Roast the game hens in the oven for 15 minutes. Reduce the heat to 400°F. Continue cooking until the game hens are crisp and cooked through, from 15 to 20 additional minutes.